Visit Corregidor Island, located about 30 miles (48 km) west of Manila at the entrance to Manila Bay, on this 8-hour tour with hotel pickup and drop-off by private vehicle. You'll take a ferry ride across the bay to reach Corregidor, where you'll see historical landmarks and learn about the island's role as a coastal defense during World War II. Lunch is included. Your day tour starts as you meet your guide at your Manila hotel in the morning for the transfer by private vehicle to the waterfront, where you'll board a 150-seat ferry for the ride across Manila Bay to Corregidor Island. When you arrive, hop on the tram that takes visitors around the island. Known as 'the Rock' due to its fortifications, the island was a significant site during World War II as the last bastion to fall to Japanese forces. You'll take a guided tour of historical landmarks and military sights like the coastal defense guns, and see the audio-visual show inside the Malinta Tunnel, once the headquarters of General MacArthur during the Battle of the Philippines. Then head to the Corregidor Inn in the mid-afternoon for a buffet lunch before the ferry ride back to Manila and the return transfer to your hotel. The Corregidor Day Trip from Manila appears to be the same no matter which one you pick. You are escorted to the harbor and given tickets. You board the ferry, climb up on a tram and the guide from the park explains things as you meander and see the major sites on the island. The tour is very educational and the trams allow picture taking from their open sides. Although our brochure promised three bottles of water on this tour, they never materialized and we forced to purchase our own. I have been here before but wanted my husband to experience it too. This trip is totally worth it. 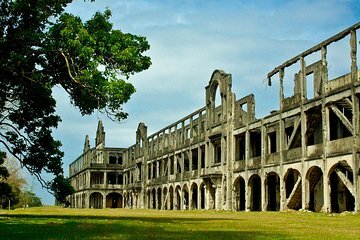 I really wanted to spend overnight at the Corregidor Inn but it wasn't available due to renovations. Food was great, the staff were awesome. I just wish our group was separate from other groups in the Light and Sound experience because all I heard was the voice of the interpreter.